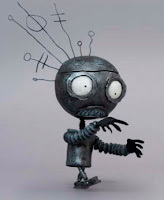 In celebration of Family Day, the Tim Burton exhibition at the new Lightbox centre will be FREE on both Sunday, February 20 and Monday, February 21 from 12pm to 6pm. The Lightbox centre opens at 10am. There are also free film screenings on both days! 4:30pm – Sherlock Jr., 1924 — Buster Keaton (with live music from iNSiDEaMiND; see the Toronto Star interview with Cheldon Paterson and Erik Laar plus Silent Toronto's Buster Keaton, turntables and sound effects: The early days of cinema redux. The Mary Pickford: The Invention of the Movie Star, on the 4th-floor in the Canadian Film Gallery runs free from January 13 to July 3, 2011. For families with children, Lightbox is also bringing back Bibi Blocksberg (2002, Germany; previously screened for Halloween), and Singin' in the Dark hosted by Shawn Hitchins (presented during the 2010 Nuit Blanche celebration). Thanks to all for 2010!